First Paragraph: Eugenia Lincoln was a practical person, a sensible person. She did not have time for poetry, geegaws, whoop-de-whoops, or frivolity. I'm posting this on a Monday, Esteemed Reader, because I know that if you're a fan of middle grade fiction, you're a fan of Kate DiCamillo, and you've probably read all her books. But you haven't read this one (probably) because it doesn't come out until tomorrow. But I'm a big deal blogger (living the dream), and I've already read the newest Kate DiCamillo, so neener-neener. Speaking of a big deal, something else I've read that you haven't: Kate DiCamillo's answers to the 7 Questions. Oh my god, you guys, oh my god, she's going to be here to face them on Wednesday and it's going to be hugely epic, so make sure you come back. 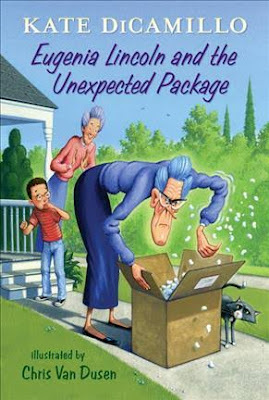 By then, you'll have read Eugenia Lincoln and the Unexpected Package because I'm about to tell you how much I enjoyed this lighthearted romp that's written with a precision that makes it worthy of study. Anyway, mores the pity, because there's a whole shared DiCamillo universe I've been missing out on. But I'll be catching up with a quickness. Eugenia Lincoln and the Unexpected Package is the fourth in the Tales from Deckawoo Drive series that is connected to the Mercy Watson series, which is also illustrated by Chris Van Dusen, who deserves his own separate review as his illustrations add so much to this story. Each book in the series tells the tale of a character from a group of related characters that pop into each other's books like the superheroes in Lisa Yee's Batgirl at Superhero High. This is a whole lot of fun and means almost every character introduced on Deckawoo Drive is fully realized enough to be the star of their own future story. She had never been so frustrated in her life. Actually, this was not true. Eugenia spent a large portion of her life being frustrated. It was hard not to be frustrated. The world was just so... frustrating. Eugenia Lincoln was very fond of lists. They helped her think. Lists calmed her. They made the world seem orderly and reasonable and manageable, even though the world was none of these things. You know what, let's go back to the first paragraph at the top of this review, because Kate DiCamillo does something quite extraordinary with the opening of this book that you can really only get away with in a middle grade work, which is one of the reasons I love this genre so much. Remember, this novel is aimed primarily at children 6-9 years old. DiCamillo starts off this book by telling us exactly who our main character is and what her relationship is with her sister. Granted, most readers will have just completed the third book in this series, which is focused on Baby Lincoln, but still, this ordinarily something I'd harp on my critique partners for. But if the YA Cannibals wrote for a much earlier reader, I'd be dead wrong (happens a lot). She believed in attending to the task at hand. Eugenia Lincoln believed in Getting Things Done. Baby Lincoln, Eugenia's younger sister, loved poetry, geegaws, and whoop-de-whoops of evey sort and variety. She was especially fond of frivolity. "We are diametrically opposed," said Eugenia to Baby. "You are woefully impractical. I am supremely practical." "You are soft, and I am sharpened to a very fine point, indeed," said Eugenia. "Suppose nothing," said Eugenia. "Believe me when I say that your head is in the clouds, and my feet are planted firmly on the terra firma." "If you say so, Sister," said Baby. "I say so," said Eugenia. And that is how it as with Eugenia Lincoln and Baby Lincoln. Until the day the unexpected package arrived. Spoiler, the unexpected package is an accordion. Actually, this is a story that is mostly impervious to spoilers. The official description of the novel pretty much lays out the whole plot. The tagline is: "What will it take for a cynical older sister to realize she's a born accordion player—with music in her heart?" I mean, maybe there's a chance Eugenia won't learn to play the music of her heart, but I'd bet all the money in my wallet she will. "Miss Lincoln," said Frank. "Don't you want to know who sent you the accordion?" Eugenia felt a small ping of uncertainty. It was the ping of the unknown, the unexplainable. Eugenia did not care for such pings. "I do not want to know," said Eugenia. I'm not going to tell you who sent the accordion as that remains a mystery to the end of the novel, but it's not a shocking reveal. I suspect most readers will know who the sender was before it's revealed because there's really only one character with motive, but it's a kind motive, and adds to the charm of this story. You see, Esteemed Reader, this isn't one of your big time mysteries with lots of false leads, nor is is an overly-complex narrative. At 112 pages (many of which have pictures), it's short and sweet and it will put a smile on the reader's face, because that is its reason for being. This is a warm and safe sort of story filled with mostly pleasant happenings despite its curmudgeonly lead character. As a man who spends a lot of time in the realm of horror, I appreciate such a story where there's no chance of a sewer clown. No doubt younger readers, who face horrors of their own, will appreciate the respite as well. We know Kate DiCamillo can tackle more complex stories and darker themes as we've seen her accomplish both, but this is a different sort of book, every bit as essential to a child's love of reading. A child could devour this story in an afternoon and still have more books available. They would laugh and smile and look forward to the next tale of Deckawoo Drive, which would mean the book accomplished fully its intended purpose. This is as noble a pursuit for an author as an epic tale, such as the one of Despereaux. That pretty much concludes the review portion of this review: this book was good. I liked it. You will like it too. Now, let's talk about technique, because there's a lot of it on display here. The thing to watch for is DiCamillo's economy of words. Remember, she's got 112 pages with sparse words and a lot of illustrations, so every sentence counts. She can't spend 800 words describing any one character and their backstory unless it's Eugenia, and even she doesn't get that many words of description in a row. What DiCamillo does is pick out a few evocative details to suggest the full character. That effect combined with defining dialogue (no two characters speak the same way, however sparse the dialogue may be) creates multiple characters the reader can clearly see and identify with and look forward to revisiting in future tales. I'd also be curious to know what notes she gave to her illustrator, as he accomplishes a lot of the description, but certainly not all. Eugenia opened it and discovered a small, round man. The man was wearing a green velvet suit and a green velvet hat. The hat resembled a moldy mushroom. The man smelled like lilacs and musty curtains and butter. The man had a large number of teeth. More teeth than the average person, it seemed. Eugenia felt it would be dangerous to trust such an excessively toothy person. But still, she had an accordion to sell. She couldn't afford to be overly particular. Life was too annoying and unpredictable and pig-filled to be borne, sometimes. She went into the living room and saw that the pig from next door had invited itself into the house and was now sitting on the couch and staring into space as if it were thinking, which it most certainly was not. In the morning, Eugenia rose from her bed and went out to the kitchen and found that it was in severe disarray: chairs were overturned, crumbs were on the counter, unwashed plates were piled in the sink. There was an entire fruitcake in the center of the kitchen table. A fly was hovering over it, buzzing happily. "Bah," said Eugenia to the sun. What are you learning from the encyclopedia?" she said. The Tale of Despereaux is one of my kiddos favorite books. Looking forward to your 7 questions.